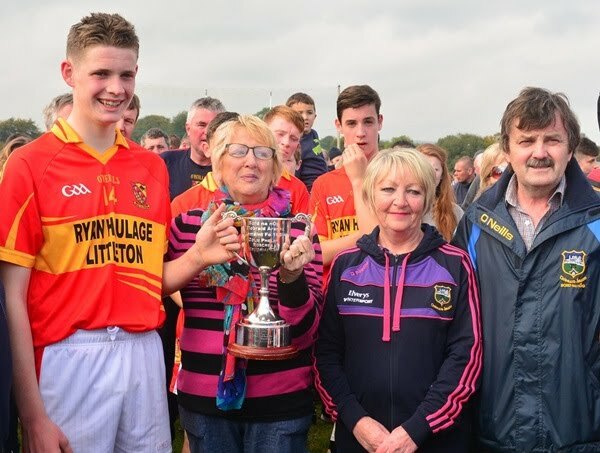 History was made in euphoric fashion last Saturday afternoon, October 3rd, when the young men of Moycarkey-Borris came of age with a dominant second half display to win the Under 16 A County Title as they claimed the Colm Phelan Memorial Cup for the first time. A trawl through the history books would take you back to 1974 when this famous club last hoisted the U16 crown. That famine was finally obliterated by a tremendous set of players, who from the throw in, set about their task with purpose, determination and unity as each fought and helped one another right to the end and with that earn the reward their efforts deserved. In calm dry conditions, Annacarty looked picturesque as it held centre stage for the showpiece final of the season. So with the game on Nenagh Éire Óg were first into attack with Killian Malone and Jake Morris both shooting wide with their opening shots at the posts. No such problem for the Moycarkey lads as good interplay between Jack Fallon and Darren Flood resulted in a Moycarkey free which ace marksman and captain Anthony McKelvey made no mistake with in splitting the posts to put his side on the board on two minutes. However, Morris was causing problems in the ‘Borris half back line and two quick points, his first a free, saw his side in front as they settled better in the opening minutes. Moycarkey now composed took control and tormented the Nenagh defence shooting over five in seven minutes to take a firm control on proceedings. Fallon started the scoring spree before McKelvey added three in quick succession. Flood opened his account after Caolan O’Brien fielded superbly and laid off the handpass to Flood who made no mistake at the end of the first quarter. A loose ball out of the Moycarkey defence went straight to Nenagh captain and centre back Mark O’Farrell whose long ball back into the Moycarkey inside line was caught by Malone who rifled to the net from close range, game on again. The Moycarkey response was swift, McKelvey aced two more frees before Flood got his second. Two points followed for Nenagh when ‘Borris were dealt a blow when the flying Fallon had to leave the field with a blood injury. There need have been no worries for Moycarkey supporters though as his replacement John Kirwan played an inspired role in the destination of the result following his arrival onto the field. Max Hackett up to his usual high standard and delighting in his play put three between the sides on twenty two minutes as there was now little really between the sides. McKelvey added another between a Nenagh brace to leave ‘Borris ahead by two going into added time. One last push for Nenagh proved crucial as Morris found the net for his side’s second goal to leave them one ahead, 2-6 to 0-11 after a most entertaining first half. The earlier injury prevented Jack Fallon from returning for the second half and Kirwan was duly named as his replacement with Bill Maher also coming on in the half forward line. And straight away Moycarkey were at it again, a brace of points from Flood inside the opening minute had his side back in front. Conor McCarthy levelled it for the third time before Morris pushed Nenagh’s noses back in front from a placed ball. But that would be as good as it would get for Nenagh as a string of seven wides put paid to their hopes. Moycarkey on the other hand were more ruthless and when McKelvey levelled affairs on seven minutes also from a placed ball, it signalled the start of a tremendous Moycarkey revival. The passion in their play was matched with similar accuracy at the posts. The following minute McKelvey hit a lovely low ball to Max Hackett who majestically pointed to put his side back in front once more. Two minutes later Flood now operating in scintillating mode fed Jack Hackett, who with work still to do crashed the ball to the Nenagh net, ‘Borris up by four. Two more from McKelvey followed before he turned provider in good interplay with Kirwan whose wonderful point eased Moycarkey into the final quarter. An exquisite piece of skill from Flood followed, who on receipt of a deft pass from Max controlled the ball and pointed off his right without the sliothar touching his hand much to the delight of his sides’ supporters. Remarkably with eleven minutes left and eight between the sides that was to be Moycarkey’s last score. The stranglehold they took on the half seemed to stem the blood flow in their opposition who were helpless in reply. However try they did but in a resolute Moycarkey defence they found no joy. Earlier looseness had now been replaced by composure and craft, as both the inside and half back units were dogged in their resistance. So much so that out of the last four points Nenagh scored in attempting to resurrect their title hopes three came from placed balls as Moycarkey Borris marched onto the title in emphatic style to start wild celebrations. Heroes one and all for Moycarkey Borris and how they savoured the victory, selectors Michael ‘Shiner’ Heffernan and Noel McKelvey hugged in joy with mission accomplished as supporters flooded the field to acclaim their red and gold warriors. It was certainly a “carpe diem” moment for this side who will have life long memories of a tremendous visit to Annacarty. In goal Rhys Shelly had a solid display and there was nothing he could do for either goal. His superb puck outs launched many a Moycarkey attack and he can be well pleased with his performance. The inside line of Kieran Kearney, Rory Darmody and Kevin Hayes was strong throughout, with Hayes and Darmody in particular having a terrific opening half. In all they only coughed up one point between the three of them to their markers, no mean feat at all. Facing the likes of a superb Nenagh half forward line, there was always going to be pressure on the Moycarkey half back set, though Michael Murphy was the most industrious throughout. The more the game developed the more the lads gained a foothold and by the time the final quarter came round Philip Ryan, Zach Jackson and Murphy had the measure of their men taking no account of reputations beside them. The midfield partnership of Jack Fallon and Jack Morrissey matched Nenagh toe for toe. Following Fallon’s withdrawal the balance tipped in Moycarkey’s favour as John Kirwan’s no nonsense and direct approach endeared him to all as he put in a terrific shift with Morrissey. Then it was down to the two forward line units where Moycarkey Borris sparkled and revelled in their display. On the wings Caolan O’Brien and Shane Maher were ominous in their threat as was Bill Maher when added to the fold for the second period. The Hackett brothers, Max and Jack proved an absolute handful for their markers in the corners with Max always scheming, darting, looking for an opening at every opportunity to exploit weakness and pick off a score or to find a man. The players in the spine of the Moycarkey Borris attack Darren Flood at centre and Anthony McKelvey at full delivered outstanding performances as both were central and crucial to the Moycarkey Borris victory. Flood’s second half display was as good as will be seen on any field this year while McKelvey was just immense throughout and led as a captain should by superb example. This win was crafted on diligent work by the Moyacrkey Borris mentors who certainly had their homework done with the matchups well and truly nailed. To each take a bow. Amidst wild cheers of celebration, Neil Ryan, Co. Coiste na nÓg PRO, presented the Colm Phelan Memorial Cup to winning captain Anthony McKelvey on this historic day for Moycarkey Borris. Moycarkey-Borris: Rhys Shelly, Kieran Kearney, Rory Darmody, Kevin Hayes, Philip Ryan, Zach Jackson, Michael Murphy, Jack Fallon 0-1, Jack Morrissey, Shane Maher, Darren Flood 0-5, Caolan O’Brien, Max Hackett 0-2, Anthony McKelvey (C) 0-10 (0-8f, 0-1’65), Jack Hackett 1-0. Subs used: John Kirwan 0-1, Bill Maher. Also; David O’Donnell, Donal Fitzpatrick, James Dillon, Eamon Martin, Philip O’Sullivan, Tom Ryan, Seán O’Meara, Mark Heffernan. Extended panel: Conor Cummins, Peter Melbourne, Padraig Blake, Diarmuid Maher, Brendan Looby, Aidan Scott, Daniel Browne, Pat Hackett, Bill Hackett, Michael Maher, Ciarán Kirwan, Kyle Shelly, Bill Gleeson, Ben O’Dwyer. Mentors: Michael Heffernan, Dermot Maher, Noel McKelvey, Kevin Moran, Michelle McKelvey, Colm Ryan, Pio Spillane. Subs used: Dan O’Donovan. Also: Sean McTiernan, Cian O’Brien, Shane Flynn, Steven Hallinan, Mark Carey, Alan Manning, Barry Coffey, Aaron Whyte, Conor Hennessy, Conor Sullivan, Liam Heffernan, Luke Carroll, Rory O’Donovan. The A final was eagerly awaited with Nenagh Eire Og hoping to make amends for their disappointment in both the 2010 and 2012 finals which were ironically against mid champions Durlas Og and Drom & Inch respectively. On the other hand mid champions Moycarkey Borris were hoping to bridge over a forty year gap in their quest for glory. Referee Noel Cosgrove got matters underway @ 2pm. Jake Morris laid on the opening attack for Nenagh only to see his effort slightly off target. Seconds later honour eluded him as a free which seemed to be floating over left disappointment as it tailed off. Moycarkey Borris captain Anthony McKelvey made no mistake with his free as it sailed over for the opening point of the game. However on the sixth minute Jake Morris did likewise to level matters and quickly added another from play to put Nenagh ahead. Moycarkey Borris keeper Rhys Shelly was on his mark thwarting any raids into his area. Moycarkey were being served very well by the defensive work rate of Rory Darmody,Michael Murphy, Kevin Hayes and company. On the eighth minute, Jack Fallon pointed for Moycarkey to level matters at two points apiece. Another pointed free by captain McKelvey followed two minutes later with a successful .65 to put his side two points up 0-4 to 0-2. Darren Flood, Jack Fallon and Max Hackett were really upping their work rate to the delight of the mid supporters. The Nenagh defence of Fiachra Starr, Evan Murphy and captain Mark O'Farrell ,while in attack Killian Malone, Conor McCarthy were a joy to watch. Darren Flood added a point for the mid side for a six point to two score reading in favour of the mid men. On the fifteenth minute Nenagh captain Mark O'Farrell laid on a pass to Killian Malone which caught the Moycarkey defence for the opening goal. Max Hackett was always in threatening form showing boundless energy and from a foul on him up stepped captain McKelvey for another pointed addition for Moycarkey. Two minutes later he repeated the exercise to increase his teams lead 0-8 to 1-2. Another Darren Flood point increased the Moycarkey advantage to four points. Nenagh responded with points from both Conor McCarthy and Jake Morris for a 0-9 to 1-4 score line. Max Hackett pointed for Moycarkey which prompted another Nenagh response with a pointed free by Jake Morris and one from play by Killian Malone. Anthony McKelvey pointed another Moycarkey free to put his side 0-11 to 1-5. Then came a Nenagh flourish as Sean Shanahan pointed as the full time was approaching and in injury time Jake Morris sent a rasper to shake both the Moycarkey net along with their supporters spirits to take an interval lead by a single point on a score reading Nenagh Eire Og 2-6 Moycarkey Borris 0-11. The mid men re-entered the action with a substitution as Bill Maher replaced Shane Maher. Two successive points by Darren Flood had turned the scales in favour of Moycarkey with the score reading 0-13 to 2-6 within a minute. Seconds later Conor McCarthy pointed for Nenagh to level matters on the two minute mark 0-13 to 2-7. Nenagh captain Mark O'Farrell was leading by example putting in a tremendous effort as were Killian Malone, Sean Phelan and Jake Morris. Jake put his side one point up again on the fourth minute but it was to be short-lived as Moycarkey captain Anthony McKelvey pointed a free to bring the sides all square for the fifth time. Jake Morris was unfortunate to see his next two frees come off the woodwork. On the ninth minute Max Hackett slotted Moycarkey into the lead once again with a brilliant long range point and two minutes later the Moycarkey followers went ecstatic as Jack Hackett had the Nenagh net rattled which resulted with his side going four points up 1-15 to 2-8. Moments later another McKelvey point stretched the mid advantage..Dan Molamphy made way for Dan O'Donovan in the Nenagh attack on the eleventh minute. Michael Murphy, Caolan O'Brien and John Kirwan were shoring up any opposition threats for Moycarkey while on the other hand Nenagh efforts were tailing off the mark. As the game was entering the final quarter captain McKelvey pointed another free which was quickly accompanied by another point from John Kirwan to put Moycarkey in a comfort zone with an seven point advantage 1-18 to 2-8. On the nineteenth minute Max Hackett laid on a beautiful pass to Darren Flood which sailed over the crossbar. Nenagh responded with a pointed free by Conor McCarthy but time was running out for the north men. Sean Shanahan, Conor Bonnar and Jake Morris were trying very hard but the Moycarkey defence were in command. Moycarkey although enjoying a comfortable lead were missing the opportunities that came their way. Their last four frees went off target while Nenagh added three points a free on the twenty seventh minute by Jake Morris, followed moments later by another from Conor McCarthy with the final point from play and of the game by Conor Bonnar for a final score reading Moycarkey Borris 1-19 Nenagh Eire Og 2-12. There were scenes of jubilation for Moycarkey while Nenagh were gutted having lost out on county honours for the third successive time in this grade. The PRO Neil Ryan praised both sides on a brilliant contest and commiserated with Nenagh Eire Og citing that they will be a force at minor level. He thanked all involved in Annacarty for having everything in top class order and acknowledged referee Noel Cosgrove and his full team of officials on a job well done. He complemented Moycarkey Borris on their great performance and congratulated them on winning the title. He welcomed Michael and Marie Phelan from Roscrea the parents of the late Colm who tragically killed in Galway in 1996 to present The Colm Phelan Memorial Under 16 A Hurling cup to victorious Moycarkey Borris captain Anthony McKelvey.